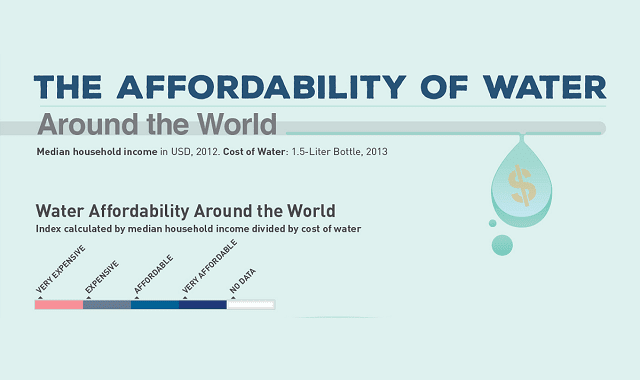 The Affordability of Water Around the World #Infographic ~ Visualistan '+g+"
In many countries basic amenities like drinking water take up a large chunk of the average person’s paycheck. As water scarcity will continue to be a problem in this decade and continue to get worse in the next, it’s important to remember that it will affect different parts of the world disproportionately, with specific countries in Asia, South America, and Africa often not having access to clean, bottled water. We painted this picture by taking the median household income of countries across the world and comparing that with data on the cost of a 1.5-liter bottle of water. The top chart shows the ratio of the two in terms of a heatmap, with areas where it’s expensive in pink. Below that, we created a scatterplot, with each country resembling a dot on the graph. For the final graph, we showed the frequency – how often the median household income and water cost met, painting a clearer picture of how dire the situation is in much of the world.